NOTE: This content is old - Published: Tuesday, Jan 12th, 2016. Wrexham Council’s Executive Board today unanimously decided to go forward with plans to demolish the remaining Groves school building. The debate in the Guildhall this morning saw opposition from the floor, and live outside the chamber on social media to the plans as they went through. 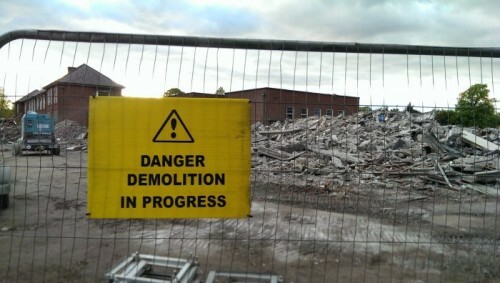 The town centre site was set to be rejuvenated by Coleg Cambria, however after some helpful bats the land was retained by Wrexham Council to possibly build one or more new schools. Following our story on the plans last week to demolish the buildings on the site entirely a petition was launched to preserve the red brick building which at the time of the meeting had reached over 900 names. The short timescale involved in the proposals was criticised, with them first made public last Wednesday afternoon to those who enjoy scouring Wrexham Council’s website, and more widely known about on Thursday. Wrexham Council Leader Mark Pritchard defended the speed of the work several times, saying that the building has been unoccupied for several years and decisions have been ‘avoided’ by previous administrations. Clr Pritchard says speed needed due in part to asbestos, ‘youngsters get in there & smash it & get contaminated’, asks Cllrs to be ‘bold’. Mothballing was due to cost £375,000 and current costs are around £25,000 to maintain security, with retaining just the facaded costed at over £400,000 with additional ongoing costs. Cllr Ronnie Prince told of his sentimental memories of the school as he was a former pupil, but said he was putting those aside to support the report saying although the ‘high ceilings and long corridors’ were nice, the ‘building will not fit the criteria of a 21st century primary school’. Cllr O’Toole gave detail at length of responses she has encountered on the doorsteps of local residents, saying she had spoken to roughly half of those in the area. Cllr O’Toole said as a result of this direct interaction she was not in a position to support the recommendation to demolish the building and ‘of people spoken to the majority of reaction was opposition to demolishing it’. There was reference to residents understanding the viewpoint for needing new school capacity however the plans before the meeting ‘was not what people thought was going to be the plan’ saying ‘people thought the present building would be preserved as a school’, ending by saying ‘people are keen to keep what was is part of their heritage’. Concern was voiced that ‘the public have had less than a week to digest’ the plans, with it noted that the Member was ‘taken aback by the strength of the feelings expressed’. Due to this there was a request for the Executive Board to defer the decision, with others asking for a consultation to be launched on the issue. Cllr Andy Williams said he was ‘strongly against it being demolished’ saying it was a ‘beautiful building’, favouring retention of the facade at least pointing to the conversion of the War Memorial Hospital as good use of an old building in a modern context. Meeting told Cadw not interested in Groves site. War Memorial Hospital, now Coleg Cambria, cited as a great way to use old buildings. Cllr Dana Davies asked about the future of the site, with a response being that one of several options could occur including one or two schools on the site including a possible faith school. Despite some issues such as transport being rejected as part of the debate as they were deemed to be dealt with under planning applications, the meeting was promised an ‘iconic’ replacement building for educational purposes. The Council Leader referenced numerous contacts over the proposals, including a letter from the local MP Ian Lucas, saying: “I am disappointed that elected members who have contacted me have forgot we have to use the site for education.” Paying tribute to those who placed a convenant on the land to restrict the lands use to educational use, he said previous work had taken place under previous administrations to remove the restriction and he believed if that had been successful the land could have been sold off for housing. Many Councillors spoke with similar thoughts over the plan, with the theme being that the building was part of the heritage of the town, with one saying it is ‘the largest character building in Wrexham’. Clr Brian Cameron now reading out email from @IanCLucas sent yesterday & reply sent today. Says just ‘4 days notice’ on the Groves plans. A full email was then read from MP Ian Lucas who is against the plans, however Cllr Pritchard said he was open to discussions but had not seen either the MP or AM. Clr Pritchard saying ‘confidentially broken’ with @IanCLucas’s letter being read – Mr Lucas had published it in full on Facebook yesterday. @wrexham I saw him last week in a meeting! @wrexham When the Council Leader proposes an appalling course like demolishing the Groves without consulting the people of Wrexham, I act. @MarcusJonesWxm @ConservativeWxm @wrexham Tory Executive Board members voted for demolition without consultation. That’s what they did. @IanCLucas @wrexham your constant politicising is ridiculous.Did these Labour councillors only make ‘bad’decisions after leaving your party? The meeting was told any demolition and rebuild could take around three years at the absolute quickest, with it likely taking many more. In the meantime the flattened land is due to be used as a car park. Cllr Alun Jenkins said that the Executive Board was ‘taking the decision for 52 of us’, talking of the other Councillors who are not on the Executive Board, ‘The strength of feeling is quite clear, if we had the means we would want to see building retained’. Again with the ‘weeks notice’ referred to, he was critical that ‘no one can have their say’ asking for a delay to ‘hold a public event to see the details’. Clr Alun Jenkins cites petition. Currently at 902 names, or 50% of budget consultation, or 368% of Arts Hub consultation responses. Cllr Wynn said similar, saying: “The general public have been denied an opportunity to be consulted on this’ again favouring deferment saying ‘an extra few months in the scheme of 12 years isnt that big in the scheme of things’. Just prior to the vote Cllr Pritchard thanked all Councillors for voicing their views, and reiterated that he did not think the issue had been rushed into saying that it was not an emotion based decision rather a ‘balanced decision’ to ‘move forward to put education provision on the site’. ‘Largest character building in Wrexham’ & other support for Groves from the floor, although power is at the top table so likely irrelevant. The Council’s Executive Board all voted in favour for the recommendation to demolish the building and to clear the site. Read 1,158,648 times in last 30 days, and 74,065,474 times since we started in 2011.